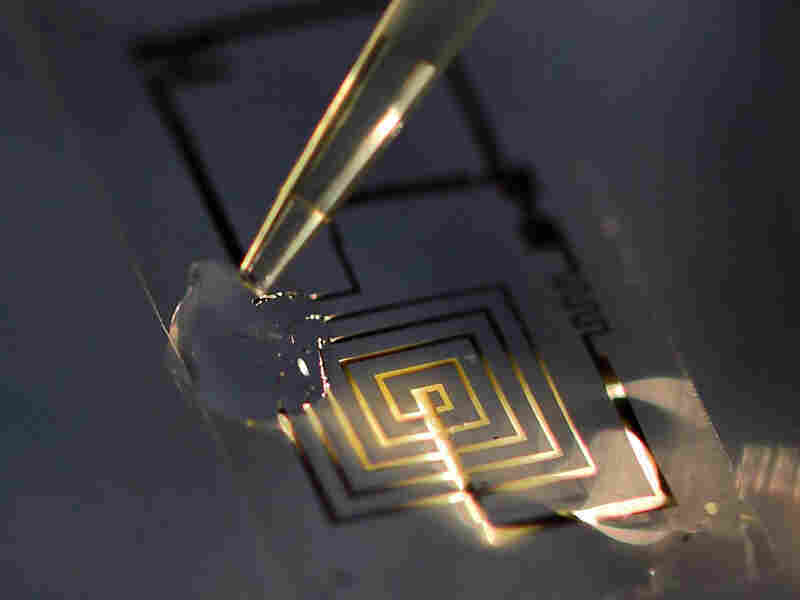 Medical Electronics Built To Last Only A Little While : Shots - Health News Using silicon, magnesium and a special type of silk, scientists have created electronic circuits that dissolve in liquid. 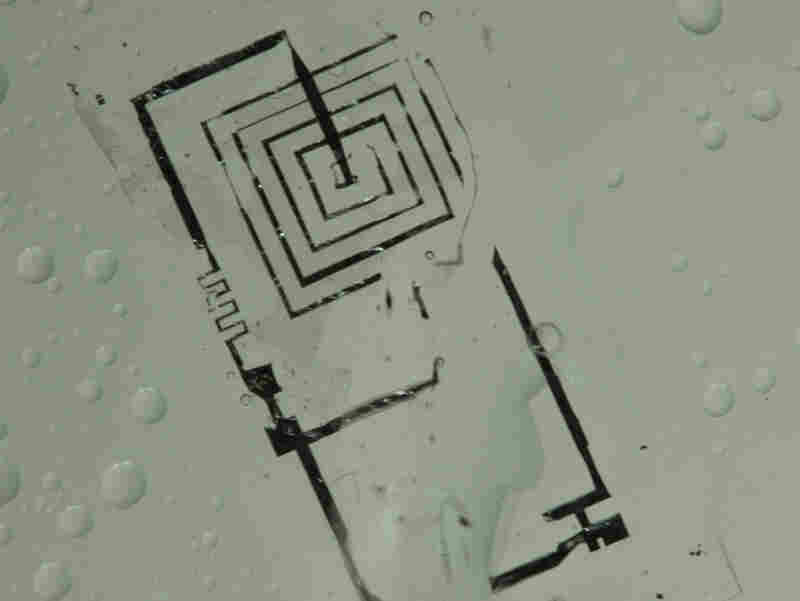 Electronics like these could be useful in future implantable medical devices. An electronic circuit begins to dissolve. 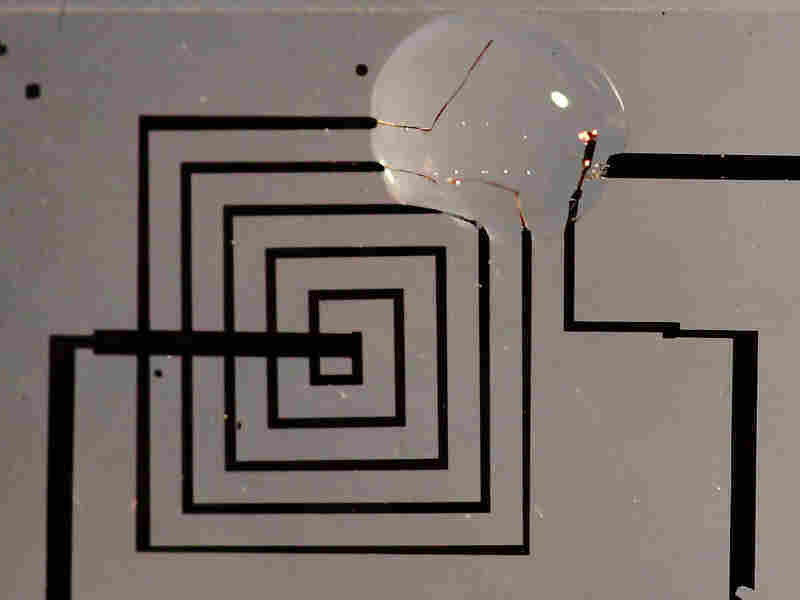 Circuits like this one could be useful in implantable medical devices. If these medical implants dissolve in the body, they could eliminate the need for surgery to retrieve them. The circuits are made of silicon, magnesium and a special kind of silk, all of which can be designed to dissolve after a fixed period of time. Most engineers build things to last. But a group of mechanical and electrical engineers are working on electronics that will break down in as little as a couple of days. On purpose! The electronic circuits they're developing don't crash. It's more dramatic than that. They dissolve in liquid. Sounds a little bit crazy, but circuits that work for a while then disappear could be pretty useful in medical devices implanted in the human body. In a paper published in the journal Science, the engineers describe how they used silicon, magnesium and a special type of reconstituted silk to create a microchip that can last for as long as needed, then fade away when its job is done. "It will have a finite lifetime while in a wet environment," says Fiorenzo Omenetto, an electrical engineer at Tufts University who co-authored the article. Right now, some medical implants have to be surgically removed when they've overstayed their welcome inside the body. But if these devices could instead dissolve and get flushed out through the body's natural processes, surgery could be avoided. That's one of the potential benefits for dissolvable electronics, but definitely not the only one. Omenetto says they says might also be used to create more environmentally friendly consumer devices, like iPhones or televisions. "Electronic waste is not a pretty waste," Omenetto tells Shots. "Anything that could be done to use more benign materials [in electronics] could help." At this point, you might be wondering how these electronic devices could possibly function while submerged liquid and not experience catastrophic short circuiting. It all boils down to silk. Omenetto and his colleague at Tufts, David Kaplan, have been experimenting with silk for years and have used it to develop a biodegradable plastic-like material. The silk-based material can be programmed to dissolve over a predetermined time period — six hours, six days, six months, you name it. Omenetto teamed up with mechanical engineer John Rogers at the University of Illinois at Urbana-Champaign to design a magnesium and silicon circuit encased in this silk-based material. "The silk is water-soluble, but its dissolution rate can be controlled," Rogers says. "We used that as a protecting layer to go on top of our water-soluble electronics." Once the electronics no longer need to be protected, the silk starts dissolving and then the circuit goes along with it. "Everything dissolves," Rogers says. 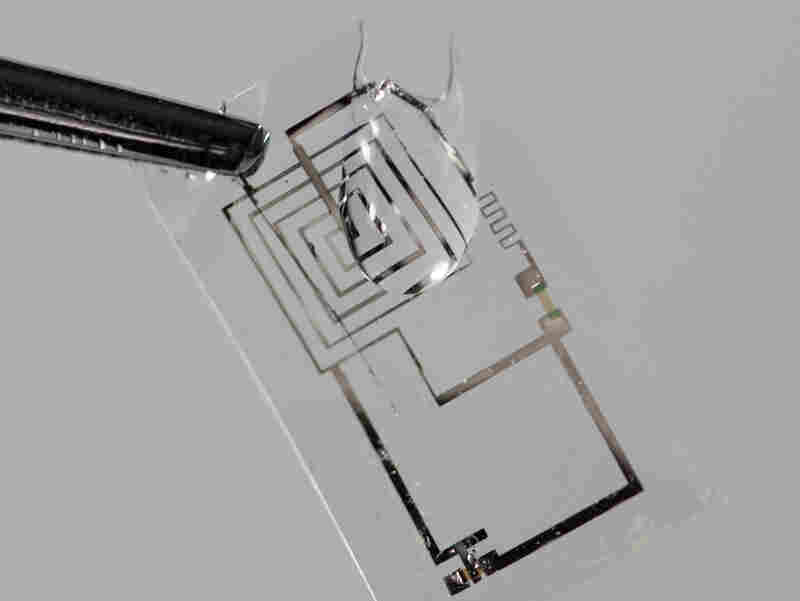 Don't expect to see dissolvable electronics in the doctor's office anytime soon. Omenetto estimates it could be a decade before they're in widespread use. Not only would these devices need to be tested and pass muster with the Food and Drug Administration, but Omenetto says someone would also need to figure out how to mass produce these circuits in a factory. "People can make very nice electronic gadgets in a lab," he says, "but that's a long way from Intel." Today's Science article has people in the engineering world buzzing. "This is a small but growing field for sure," says Christopher Bettinger, a professor at Carnegie Mellon University. The key to taking this technology out of the lab and into the marketplace will be "identifying an application first — a disease or a treatment that can benefit from this," he says. "There are definitely applications that could benefit from this."